A few weeks ago, an acquaintance of mine posed a question that intrigued me greatly. The question was: Is astrological sign a potential gauge of future greatness? Being scientifically minded and suddenly enthusiastic to know the answer to this question, I began a statistical/astrological study of the most influential men in history. Before I present my list of these men, it bears mentioning that many great and influential thinkers in history do not make my list, simply because I could not find valid sources of birth date and birth place information. For example, I think it cannot be denied that the three men who most significantly changed the course of history are Jesus, Mohammed, and Buddha. If we base their birthdays not on legends and myths, but on historical writings and documents, it is strongly believed that Jesus was actually a Pisces, whereas both Mohammed and Buddha are thought to be Taurus. However, because their birthdates can not be confirmed with great precision, I choose not to put them on my list of greatest and most influential men in history. The same goes for great thinkers, writers and philosophers like Confucius, Plato, Socrates, and Shakespeare to name but a few. Sorry guys! With these clarifications in mind, I set out to create a list (see chart below) of 100 men who changed the course of history, through science, music, politics, philosophy, war, peace, etcetera. This list contains “the good”, “the bad”, the wealthy, and the poor, but one thing cannot be denied, all these men contributed in some way to change the world as we know it. For birthdates and astrological information, I used the website astrotheme.com and cross-referenced the birthdates with those cited in Wikipedia for each man. After all, I am endeavoring to perform a serious study on the matter at hand. 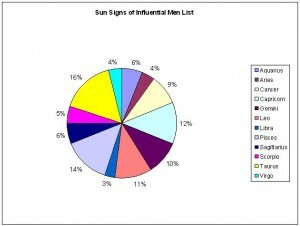 It is noted that 16% of the men on the list were Taurus, 14% Pisces, and 12% Capricorn with regards to their Sun sign. 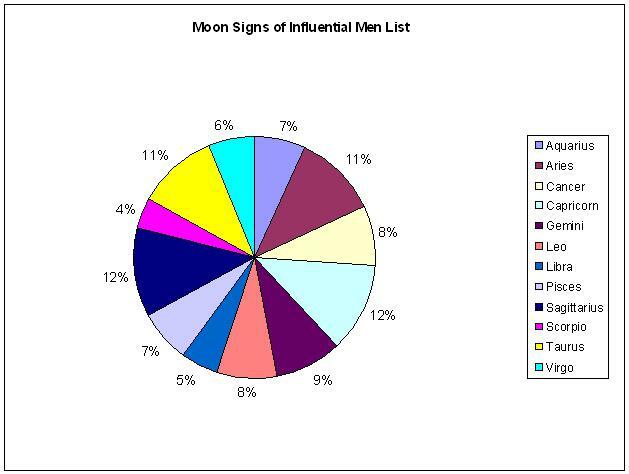 As to the Moon sign, 12% were either Sagittarius or Capricorn, and 11% were either Taurus or Aries. To avoid having people take this study to be superficial in nature, I also proceeded to calculate the averages and standard deviations of these results. For the Sun signs, the average is 8% with a standard deviation of 4%. Regarding the Moon signs, the average is 8% with 3% standard deviation. What does this statistical information mean exactly? This means that the results for the Sun signs that are 12% (or above) or 4% (or below) are “statistically significant”, and for the Moon sign 11% (or above) or 5% (or below). 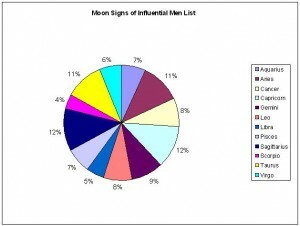 Therefore, based on the statistical study presented above, it can be said that Men born under the Sun signs of Taurus, Pisces or Capricorn or Moon signs of Sagittarius, Capricorn, Taurus, or Aries have a statistically greater chance of being the “shakers, movers, and makers” of the world. Contrarily, men born under the Sun signs of Virgo and Aries, or Moon signs of Libra and Scorpio have a statistically smaller chance of changing world history. Perhaps it bears a brief discussion as well as to what makes these Sun signs “tick”. Taurus men are known for their determination and persistence, Pisces are said to be spiritual and creative, and Capricorns are thought to be hard-working and patient in their climb to the top. As for Moon signs, Sagittarius are free-spirited and competitive, Capricorns are productive and relatively unemotional, Taurus are strong-willed and analytical, and Aries are impulsive and energetic. In conclusion, based on the study presented above, the odds of being “influential” or “making a difference” in the world, do have a statistically significant link to Sun and Moon signs.